The Air Force Officer Qualifying Test, or AFOQT, is a qualifying exam designed to be taken by applicants seeking entrance into officer commissioning programs, such as Air Force Reserve Officer Training Corps (Air Force ROTC), or Officer Training School (OTS). Professional Officer Course (POC) cadets are also required to take the AFOQT. Additionally, the AFOQT is a component in the qualifying criteria for the Pilot Candidate Selection Method, as well as entrance into air battle manager (ABM), and combat systems officer (CSO) training programs. As you may have guessed, the AFOQT is an aptitude test that includes verbal, math, and career-specific components, such as aviation knowledge. This means you can think of the AFOQT as similar to the American College Testing exam (ACT), or Standardized Admissions Test (SAT), with measures of field-specific knowledge added. While aptitude tests may seem intimidating, you can successfully achieve the scores you need to beat the AFOQT with enough exam content knowledge and preparation. If your goal is to become an Air Force Officer, the AFOQT is a necessary, but surmountable step in your path. Even though the AFOQT is very similar to the SAT or ACT, the AFOQT is much more comprehensive. Because the AFOQT can only be completed twice without a special waiver, it is important that you prepare carefully. You will be given approximately 5 hours to complete the AFOQT’s 12 sections, and you will be given at least one 10 minute break. The AFOQT is a multiple choice exam, and each question will have 4-5 possible answers. There is only one correct answer to each question and guessing will not result in penalties. Remember, it is better to make an educated guess than to forego answering a question altogether. Verbal: This section of the test is comprised of verbal analogies. It contains about 25 questions, and you will need to plan your time accordingly. Analogies are relationships between words and terms. Arithmetic: This section measures your arithmetic reasoning. This section is a basic math section comprised of approximately 25 questions. Again, timing is important. Try not to get stuck on any single question for too long. You will use your existing math skills to help solve arithmetic problems in this section. Knowledge of words: This section measures your word knowledge and contains about 25 questions. Understanding how to use synonyms is important for success in this section. Prepare with our AFOQT Study Guide and Practice Questions. Print or eBook. Guaranteed to raise your score. Get started today! Mathematics: This section provides another math component designed to measure your math knowledge. Rather than using arithmetic math skills, you will use logic to solve these problems. This section contains about 25 questions. Reading comprehension: This section measures your reading comprehension. Similar to other tests you have taken in the past, you will read short passages and answer questions about them. This section contains approximately 25 questions. Situational judgement: This section sounds intimidating, but it was just designed to measure your ability to make leadership decisions in challenging situations. If you are planning to become a junior officer, this section is doubly important for you. Prepare to read scenarios and choose the best answers for each scenario. Self-description: This section is a self-description inventory designed to tell administrators a bit about your personality. This section is heavy, in that it has approximately 220 questions. Just remember, these are questions pertaining to your personality type, so just take a deep breath and answer honestly. Science: This section measures your basic knowledge of the physical sciences. It contains about 20 questions. Studying up on basic physics, especially related to the field of aviation, will help you do well in this section. Reading of tables: This section is designed to measure table reading. This section contains about 40 questions that give administrators an idea of your ability to understand tables. Moving through this section quickly is your key to success here. Instrument comprehension: This section measures your ability to read instruments, such as dials. It contains about 20 questions and is especially important for those applicants looking to become successful Air Force pilots. Block counting: This section is a measurement of your ability to engage in block counting. It contains about 20 questions and measures your ability to visually assess three-dimensional block figures. Aviation information: This section measures your knowledge of aviation. It contains about 20 questions designed to give administrators an idea of your knowledge of aviation concepts and terminology. Brush up on your knowledge by creating flashcards of terms and facts you can find on the Air Force website. One of the best methods of ensuring you do well on the Air Force Officer Qualifying Test is to prepare. 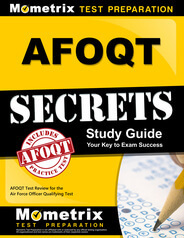 In addition to the practice materials you can find linked on the Air Force AFOQT website, Mometrix Test Preparation offers a comprehensive AFOQT guide: AFOQT Secrets. This guide is unlike any other in that you get actual AFOQT test questions that help strengthen your foundation of knowledge and skills. This guide was written by exam experts who understand firsthand how to successfully beat the AFOQT and get the best scores you can get. Our standardized test researchers have discovered the secrets of the AFOQT and are able to impart exactly how simple it can be to reduce your stress and get the scores you deserve. The AFOQT Secrets guide was designed to teach you the test based on critical content areas. This makes a difference! With the AFOQT Secrets guide, you are that much closer to becoming an Air Force Officer.